So I’m getting over like my fifth cold of the season and probably the most miserable of the lot. For several days I couldn’t taste or smell anything due to an extreme case of congestion, but today, to my great pleasure, I started noticing scents creeping back into my life: the fresh scent of a new bottle of dish soap, the perfumey aroma of Meyer lemons as I sliced them up to preserve in a jar with Hawaiian sea salt, the wood smoke from a neighbor’s chimney in the air outside. I could hardly wait to dive back into cooking after days of eating incredibly bland meals, and I may have gone slightly overboard in the process. 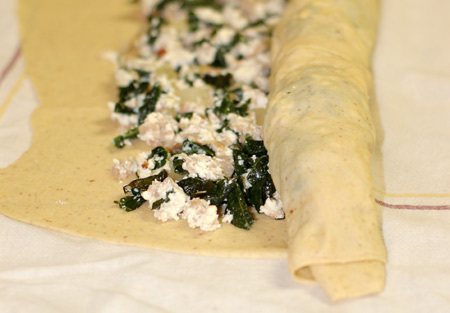 Meet the rotolo, a crazy pasta jelly roll that I filled with ham and kale. 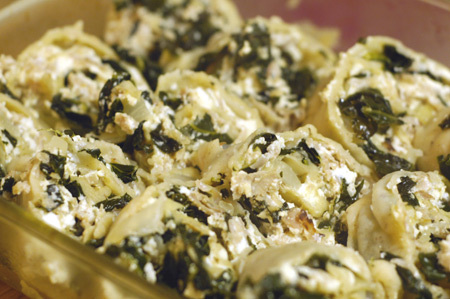 The recipe in Marcella Hazan’s Essentials of Classic Italian Cooking is called “Sliced Pasta Roll with Spinach and Ham Filling” and is accompanied by a snazzy-looking line drawing of perfectly sliced and layered spirals. I had some nitrate-free sliced ham and some dinosaur kale to use up and dove in headfirst without considering just how involved the recipe is or whether I had the rest of the ingredients I was going to need; needless to say, some adjustment turned out to be necessary for this little adventure. The first step was to get Marcella’s basic tomato sauce going. This recipe includes just tomatoes, butter, and half an onion in one piece, and its praises have been sung by many bloggers long before now. While it started simmering, I opened the fridge to pull out eggs for a batch of pasta and realized that they had all disappeared into omelets at lunchtime. Quickly grabbing our coats, I dashed down to the corner market with Nolan in the stroller, only to find that they were clean out of eggs as well. 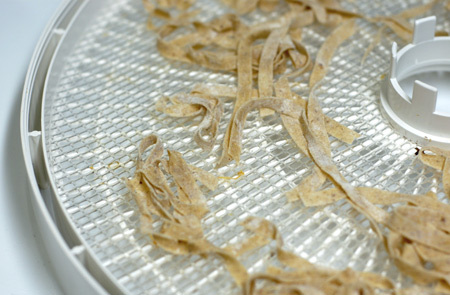 Clearly this called for some further research, and after a little computer time, I worked out an egg-free pasta recipe that seemed promising—flax gel for texture and fat, and garbanzo bean puree for protein. I actually had about half a cup of cooked garbanzos leftover from a meal the week before, and I whizzed them together with some olive oil and a little water for movement. A mixture of semolina and all-purpose flour completed the dough, which came together with a gorgeous satiny texture. Any fresh pasta dough needs about half an hour to hydrate fully before being rolled out, and I took this time to whip up another missing ingredient, ricotta cheese, which I practically never purchase at the grocery store anymore. The curds drip-drained over the sink in a flour-sack sling while I sautéed kale, wrung it dry, and stirred together the remaining few filling ingredients. 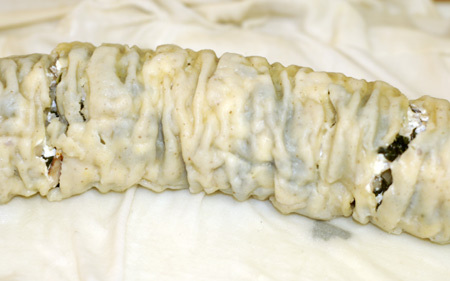 My mutant pasta dough rolled out like a dream, with just a few pinholes appearing due to the flax. The recipe calls for laying out overlapping strips to create one huge sheet of pasta; I did this right on the flour-sack towel that the roll was later encased in, which saved some trauma later on. Meanwhile, I got gallons of water heating in my roasting pan, which was the longest vessel I could lay hands on. It still wasn’t quite large enough for the towel-wrapped jelly roll, but I scrunched it a bit and curved it a bit, and made do. Half an hour later, the water in the roasting pan never did come to a rolling boil—I temped it out at 185F at one point with the burner blazing on high—but I decided to call time of death and plopped the roll out onto a cutting board for the post-mortem. As it turned out, the pasta seemed to have cooked through just fine, although it split a little where I had to curve it in the roasting pan. It is probably a good thing Jeremy didn’t wander through the kitchen right then, because I have to tell you that this thing looked disconcertingly phallic. This photo is the closest I was able to come to the tidy drawing in the cookbook, although my slices don’t show off their spiraled construction as nicely as I had hoped. Of course, the whole lot was then smothered in a blanket of tomato sauce, bechamel, and grated cheese so thoroughly that it might as well have been a lasagna or manicotti dish. But finally, after a good 2.5 hours of work, I pulled the bubbling casserole from the oven and we dug in. 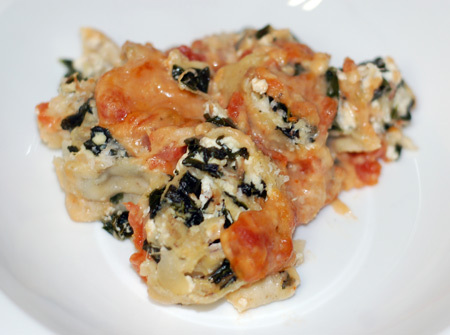 This was amazingly decadent and delicious, rich with cheese and butter and ham, but also full of healthy greens. My eggless hybrid pasta held up perfectly, but to be honest, I don’t know that the jelly roll vehicle was worth the aggravation. 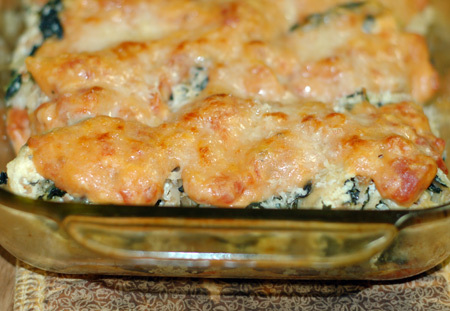 When I return to this recipe—and believe me, I will—I will probably just make it lasagna- or cannelloni-style instead. Still, it was fun to try, really on the level of a Daring Cooks challenge, and it was the perfect meal to celebrate my returning senses of taste and smell. If anyone requests the entire recipe, I’ll write it out, but for now I just want to share the pasta recipe and head to bed. In a small bowl, combine the ground flax and 3 T water, and set aside until it thickens slightly to form a mucilaginous gel. Meanwhile, in a food processor or blender, puree the garbanzo beans with the olive oil and 1/4 C water until very smooth. Dump the flours and salt into the bowl of a stand mixer, and scrape in the garbanzo puree and the flax mixture. Stir with the paddle attachment until it just comes together as a dough, then switch to the dough hook; you may need to add a bit more water or flour depending on your climate and the liquid content of your beans. When you have a dough that seems neither sticky nor crumbly, knead with the dough hook for several minutes until the dough is satiny smooth and resilient. Wrap it in plastic wrap and allow to rest for 30 minutes. 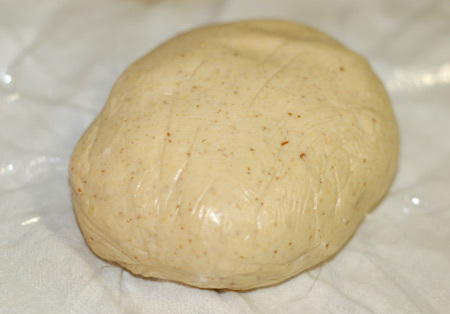 Use this dough like you would any fresh pasta dough. I use pasta roller and cutter attachments for my Kitchenaid, and was able to get the dough quite thin before the bits of flax started punching holes in my sheets. This dough can either be cooked immediately or dried; I used about half for tonight’s rotolo, and cut the rest into ribbons that dried in my dehydrator in the space of an hour or two. Looks pretty good. What does it taste like? Mmmm, it looks delicious. Thank you for sharing! I hope you feel better quick. This dish looks amazing! !